Having the ability to use a crossbow package limits the number of accessories you’ll need to buy in order to make your gear more versatile. With the Excalibur Vortex Shadow Zone Package, you’ll receive everything that you could possibly expect a high-end crossbow to have for hunting and general practice in your backyard. There are several great things that the Excalibur Vortex Shadow Zone Package can do for you, regardless of whether you have experience with using a crossbow or not. Although it’s not designed to be as user-friendly as compound bows, you can guarantee that you should be able to use it to its highest advantage. The main purpose behind this crossbow is to make sure that every user has a simple time finding and acquiring their targets while you’re out on the hunt. There are plenty of different accessories that are also included with the package to help you make the most out of your time in the outdoors. The group of people who will be able to experience the most benefits from the Excalibur Vortex Shadow Zone Package is a demographic with experience in using crossbows, as it’s not designed to teach you the ins and outs of hunting, but more the amount of power that you’ve been missing out on. For absolutely anyone who has found themselves stuck between their existing crossbow with little power and a high-end model that is far too expensive, the Excalibur Vortex Shadow Zone Package is the ideal middle-man. Even if you’re not the type of person to go out hunting, you might be curious about how crossbows differ from other models on the market, and you may have targets set up in your backyard. One of the largest advantages to the Excalibur Vortex Shadow Zone Package is that it’s adaptable to recreational use as well, giving you the ability to refine your skills on your own property in a safe and controlled environment. To get a clearer idea as to whether the Excalibur Vortex Shadow Zone Package is the right choice for you or not, it’s important to consider all of the features that you’ll be able to use to your advantage. Easy target acquisition: With the help of the Shadow-Zone multiplex reticle that allows you to switch between green and red illumination, you’ll find it’s much simpler to hunt either in the middle of the day or in the middle of the night. In comparison to traditional sights, you’ll be able to target far more game than ever before. Arrows are included: In comparison to other bows on the market, you’ll receive four separate Firebolt arrows constructed entirely out of carbon in your package. Due to their high-quality resilience, you won’t have to worry about spending more money on arrows along with the base unit itself. Padded carrying case: There’s nothing more frustrating than trying to transport your crossbow without any type of protection, which is where the padded carrying case comes into play and gives you a safe and durable storage compartment to protect all of the delicate components. Adjustable crosshair system: In order to accurately acquire your target, you can use the fully adjustable crosshair system that helps you to fine-tune the reticle for 10-yard increments. Kolorfusion camouflage: To better hide amongst the brush, you’ll appreciate the Kolorfusion designed camouflage that gives the Excalibur Vortex Shadow Zone a Realtree AP HD camo finish. Crossbows are a hefty market, and as such, there’s plenty of competition to sift through. 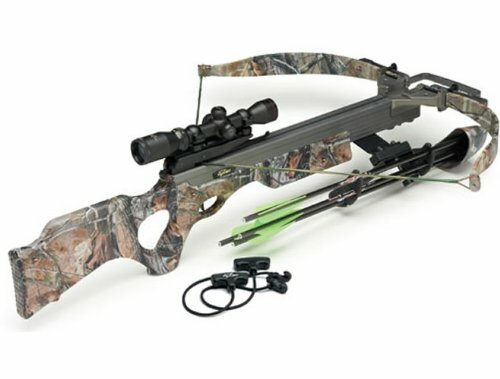 Compared to the Excalibur Vortex Shadow Zone Package, the CenterPoint Sniper 370 Crossbow Package has other features you might be interested in. Adjustable stock: To make shooting more comfortable, you can use the fully adjustable stock to create a customized fit to your body shape. Auto-safety trigger mechanism: In an effort to make hunting safer, the integrated auto-safety trigger helps to stop the user from making poor or accidental shots. Aside from those two differences, both the Excalibur Vortex Shadow Zone and CenterPoint Sniper 370 offer similar features such as included accessories, integrated string suppressors, and more. What makes the Excalibur Vortex Shadow Zone Package so unique is that it’s designed for people who have experience with crossbows, however, with the right teaching opportunities it could become a simple bow for beginners as well. No matter if you intend on taking practice shots on targets in your backyard or if you’re ready to head out into the wilderness for hunting, this crossbow is a convenient solution to have at your disposal to make hunting easier and far more enjoyable. Jen loves the outdoors and enjoys exploring a wide-range of activities. A mother of 3 whose seen far too many friends suffer from cancer, she believes Pink Crossbow reflects a sport for LIFE. It's a reminder that archery belongs to everyone regardless of age, size, or gender...and real enthusiasts aren't afraid to wear pink! PinkCrossbow.com is a participant in the Amazon Services LLC Associates Program, an affiliate advertising program designed to provide a means for sites to earn advertising fees by advertising and linking to Amazon.com. Copyright 2019 by Pink Crossbow.